In the early 1980s a new distress frequency of 406 MHz was introduced to improve the ability to locate distress beacons and reduce the number of searches initiated due to accidentally activated ELTs. 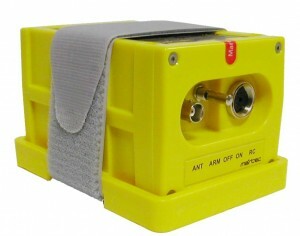 The 406 MHz transmission contains digital information including a unique identifier enabling the search and rescue authority to attempt to contact the registered owner of the beacon to determine whether the activation is a false alarm. Initially the 406 MHz frequency supplemented the existing 121.5 MHz distress frequency monitored by the international authority, COSPAS-SARSAT. Since 2009, however, only the 406 MHz distress frequency is being monitored. The phase-out of 121.5 MHz frequency monitoring in 2009 by satellites renders older ELTs such as the Pointer 3000-10 ineffective outside the range of ground stations still monitoring this frequency. Many countries, such as Russia and Japan, already mandate the installation of 406 MHz ELTs and they are required for commercial operations in the European Union. The digital message transmitted by a 406 MHz ELT includes a unique identification code, usually based on the tail number of the aircraft. Contact information for the owner of the ELT is maintained in an international database which associates this information with the identification code. It is therefore important to register an ELT when first purchased, and re-register each time the contact information changes. Some countries require re-registration annually. Each country has an authority managing ELT registration. In the United States the organization is NOAA and registration is available via the NOAA WEB SITE. To find the registration authority in other countries, visit the COSPAS-SARSAT WEB SITE. Changes in ownership or tail number of the aircraft may necessitate re-programming of the ELT in addition to re-registration. The A837-7 and C837-3 installations for the R22 and R44, respectively, utilize a later model KANNAD 406 MHz ELT having a smaller size and lower weight than the original KANNAD installations. The KANNAD 406 AF-COMPACT and AF-INTEGRA transmit on 406 MHz and 121.5 MHz (243 MHz is eliminated). The A837-7 and C837-3 installations also incorporate a Dongle, replacing the remote switch connector of the A837-1 and C837-1 installations. The Dongle contains a memory chip that stores the aircraft’s unique identification number, and programs the attached ELT each time it is turned on or a self-test is completed. This enables ELTs to be swapped between aircraft. The Dongle is wired to a three-pin connector via a short lead, allowing the Dongle to be removed from the aircraft should reprogramming be necessary. As the Dongle is much smaller and lighter than the ELT and, unlike the ELT, does not have transportation restrictions, it is much more convenient to ship the Dongle to a service center for reprogramming. The remote switch and antenna installations for the A837-7 and C837-3 installations are identical to those of the original A837-1 and C837-1 installations. The Dongle must be programmed prior to installation on the aircraft for the ELT to be functional. The 406 AF-INTEGRA and 406 AF-COMPACT are similar units except that the 406 AF-INTEGRA includes a built-in antenna as a backup to the external antenna, and has an integrated GPS receiver allowing tranmission of location along with identification information. More information on the KANNAD 406 AF-COMPACT and AF-INTEGRA may be found at the KANNAD web site www.kannad.com. Information required for programming the ELT must be submitted using the Programming Data Sheet when one of the ELT installations is ordered. If it is not possible to obtain the information required for ELT programming at the time the order is placed, the ELT may be ordered unprogrammed. The ELT should be programmed after delivery using the procedure given in ELT Reprogramming Section of this page. Information necessary for programming the ELT must be submitted using the Programming Data Sheet when a kit is ordered (the ELT or Dongle will be programmed prior to shipment.) The KI-179-1 and KI-179-2 kits for installing the older KANNAD 406 AF are no longer available. For the A837-1 and C837-1 ELT installations, the most convenient method of reprogramming a KANNAD 406 AF is to order the RHC ELT reprogramming kit, MT837-1. The kit contains two Dongles (connector containing a memory chip) that are inserted into the ELT’s remote switch connector socket. The first deletes existing code and the second programs the replacement identification code. When ordering the MT837-1, a completed Programming Data Sheet must be provided and a deposit paid that will be refunded upon return of the MT837-1 kit to RHC. For the A837-7 or C837-3 ELT installations, the Dongle Harness may be removed from the aircraft and returned to RHC or a KANNAD service center for reprogramming. The Dongle Harness is removed from the aircraft by unplugging it at both ends and cutting the ty-raps attaching it to the frame.